The ritual of burying a beloved pet is becoming all too familiar. The discovery, seeing her lying still and somewhat peaceful. The immediate concern whether it was quick or not; whether she felt pain. Kicking yourself for not being there in her final moments and hoping she wasn't scared at the end. Finally realizing what just happened and totally breaking down. Deciding where to bury her and pulling out the shovel and post-hole digger. Watching as your husband methodically digs a hole deep enough to contain her so the predators won't dig her up and eat her. That would be the ultimate punch in the gut. Saying final goodbyes, carefully placing her inside the hole and gently piling dirt on top. Searching the creek for the most perfect, beautiful rocks to place on top of her burial site. Coming back inside and figuring out where the heck to go from here. My Cleo was an Easter Egger who laid the most beautiful mint green eggs. Everyone was in love with her eggs. She was what David likes to call my "lap chicken" because anytime I would sit down next to her she would always hop up in my lap. I'd often pat my legs and say, "Cleo!" and she would jump right up and cuddle. Always staying for as long as she could and only getting down if I was ready to get up. If I pet her just the right way, she would relax and lay down on my lap. She was totally fine on Tuesday. I noticed something was wrong yesterday morning and brought her inside because she was so hot. I checked on her throughout the day and she was always sitting in the same spot. Towards the end of the day I was petting her and talking to her and she cocked her head to the side to look me straight in the eye as I told her I loved her. 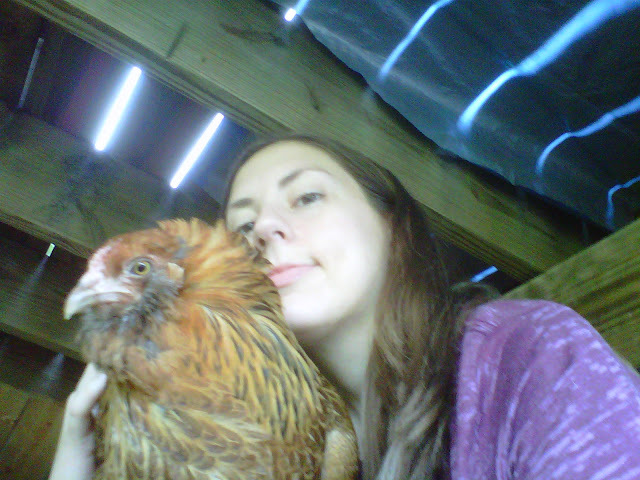 Some of my other chickens always look me right in the eye, but she never really did. Only in what would be her final moments did she look right at me and I got that feeling that made me fall in love with chickens in the first place. We were connected at that moment and I felt like she was looking right into my soul. That memory will haunt and comfort me for the rest of my life. I am so happy to have known her, but I have such a heavy heart this morning. From experience I know it will get lighter with time, but then I'll also start to lose bits and pieces of her from my memory. Maybe that's how it is supposed to be so I don't feel so raw with pain forever. For now I'm just trying to take comfort in the fact that she had the best life a chicken could ever want and I feel that she really knew she was loved. What more could I ask for? I am soo sorry for your loss. The occasional loss is the hardest part of loving critters, isn't it? She was a beautiful bird. And, even though your post made my heart ache just a little, I smiled looking at the pictures of Cleo you posted. Thank you for sharing it with us. Hi Sonja, thanks for the kind words. Losing animals is definitely the hardest part of loving them. It never gets easier. I'm glad you enjoyed the pictures; she was a very beautiful girl. You sure made me cry. It's so sad that you have to go through this, but life is such a fragile thing. I guess you can't tell why Cleo was taken from you. Just take care of the ones you have left, and know that Cleo loved you as much as you loved her. I hope you feel better soon.